Plaisir en plein air ou de détente en famille ou entre amis est à l'ordre du jour à cette belle maison au bord du lac. Nous fournissons le bateau de ligne ou de lancer votre propre (moteurs électriques seulement). Vous pouvez nager, pêcher ou profiter du soleil sur le quai spacieux. Il existe deux grands porches sur toute la longueur de la maison avec des ventilateurs de plafond, un hamac, balançoire et planeur, barbecue à gaz Weber et de table de séquoia pour manger au bord du lac. À l’intérieur, votre séjour est devenu un jeu d’enfant avec une cuisine entièrement équipée, une buanderie, 2 télévisions à écran plat avec DIRECTV et un DVR pour enregistrer vos émissions préférées gratuitement, ainsi que le WIFI illimité. La chambre principale dispose d'un lit queen et sa propre salle de bain. La 2ème chambre a un lit double et, la 3ème chambre a deux lits jumeaux. Il ya aussi une 2e salle de bain complète. Tous les draps sont fournis ainsi que les bases pour vous commencer. Les ventilateurs de plafond partout et climatisation centrale à vous sentir bien. Que vous regardiez un lever de soleil majestueux sur le lac ou assis au coin du feu, vous pourrez jeter vos soucis et profiter du cadre paisible. Nous sommes à 1/2 heure de Augusta National, à 1 heure de Columbia et à 25 minutes du centre-ville Aiken et ses nombreuses attractions. Il ya beaucoup de stationnement. Venez chausser vos chaussures, relaxez-vous et faites un souvenir! Love this cabin. Comfy beds, clean, kitchen small but well stocked with all you need for a great stay! And the view from the deck! Beautiful! Why mess with the rest, when this ones the best!!!!! This is an absolutely lovely little get away. 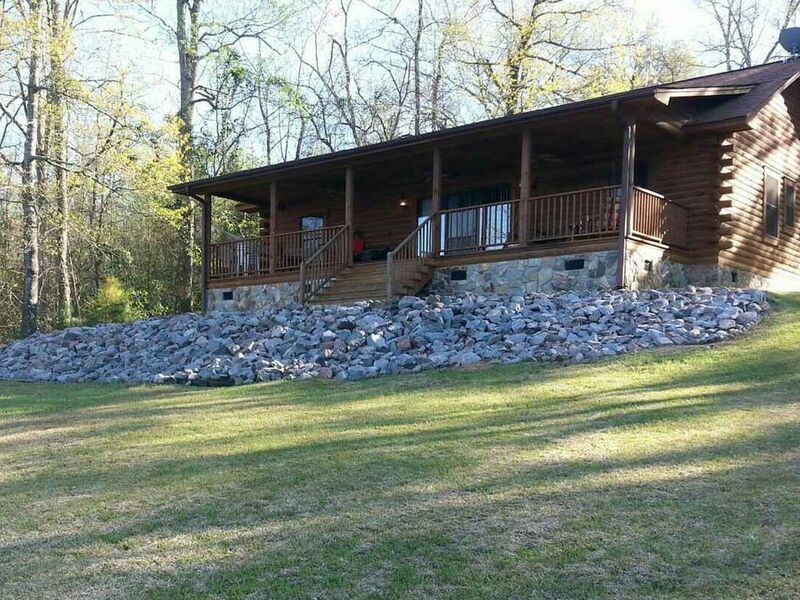 The log cabin is immaculate, and provides every convenience. The property is stunning, delightfully quite, and peaceful, with a full range of things to do. It is s "Must Stay". My husband wants to return as soon as possible he enjoyed it so much!!!! This is such a great, relaxing place to go. Sitting on the back porch and just relaxing, listening to the fish jump in the water, hearing all the other sounds of nature, and being away from the hustle and busy-ness of life. The home is really roomy and comfortable as well. Would be great for a family get together. The owner and the property manager are excellent to communicate with and are very friendly. It is a PERFECT Get-Away! We came in from out of town to visit family in Aiken and needed a space big enough for us all to hang out. This place was perfect! We had space for us to share meals together, play card games, swim, or just sit and watch the fish jump. Even Great-Grandma had a place just for her to sit quietly. It was a much needed break from the world and we loved every minute. Our family of four (two young boys) stayed at the cabin for a week vacation. We had a great time! The cabin had everything we needed and was very comfortable. We had many hours of fun in the lake, jumping off the dock and swimming around. What a great place to go for a relaxing vacation!! It is in a secluded private neighborhood, so very low traffic and very very quiet. The cabin is immaculate and well equipped with everything you could need for your stay including towels and linens. The back deck was one of our favorite places to hang out even in the South Carolina summer heat, the deck was cooler with the help of the 3 ceiling fans. The professional grill served as our main source of cooking for our stay and was very easy to operate. We enjoyed the lake and the scenery and enjoyed just sitting on the dock or looking at the water from the back porch. The cabin is a short 25-30 minute drive from town so we could still get our Starbucks fix if we wanted too!! The cellular Wi-Fi also worked well for when I had an emergency at work that required me to login and work for a while. I highly recommend this location, and my family will surely visit again!